Vin Diesel’s Amazing Car Collection! - Muscle Cars Zone! 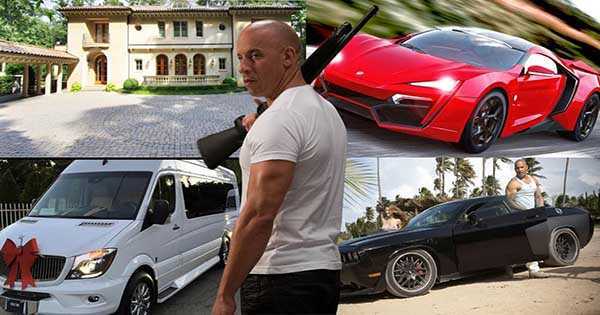 Vin Diesel’s Amazing Car Collection! It is everyone`s dream to get inside a celebrity’s garage and check out their amazing car collection. Some of the most expensive and rare cars can be found there. Though there are some celebrities who are not much into cars but still have a decent collection of cars, there are some who simply cannot get enough of them. Such celebrity is Vin Diesel himself. We are all familiar with his love towards cars from the legendary Fast and Furious series. That is why in the following video we take a look at his amazing car collection! He has literary everything; classic cars, drag race cars, new supercars and even a van can be found in his collection. To begin with we present an ultimate classic, the 1970 Dodge Charger R/T which cost him $50,000. Furthermore we can see the 1993 Mazda RX7, which is an exceptional machine, something you are probably aware off. Then we have the 1994 Toyota Supra, the 2011 Dodge Charger SRT8 costing around $32,000. Another ultimate classic is the Dodge Charger Dayton as well as the 1970 Plymouth Roadrunner. The 1974 Plymouth Barracuda and the Pontiac Bonneville follow but the most exceptional example of his amazing car collection MUST be the Lykan Hypersport 2014. This black beast had cost him staggering $3,400,000. The Lykan is the car he is probably most proud of as we all know how rare it actually is. Check the video for more. What do you think, which is your favorite one? That was Vin Diesel, now take a look at the Bill Gates collection!